“Dictatorship nations are outlaws. Any free nation had the right to invade Nazi Germany and, today, has the right to invade Soviet Russia, Cuba or any other slave pen. Whether a free nation chooses to do so or not is a matter of its own self-interest, not of respect for the non-existent “rights” of gang rulers. It is not a free nation’s duty to liberate other nations at the price of self-sacrifice, but a free nation has the right to do it, when and if it so chooses. Gaddafi came into power as an assassin and terrorist. He started out murdering, continued murdering and had been going out murdering until today. His death is no panacea but it is surely a victory for the Libyan people and their 2011 Revolution. 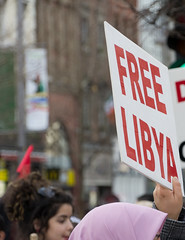 Starting in February 15th, 2011 a series of peaceful protests asked for change in the country and they were met with military force by the Gaddafi regime. Thousands were hurt and killed. Gaddafi proclaimed his despotic discourse that same night and said that the only way he was going to leave Libya was going to be in a cuffing. Indeed, that’s how he will leave the history of the country. The fight for Libyans has not finished; loyalists around the Algerian and Nigerian borders are still present and the opposition continues. I celebrate the capture of this dictator and our attention needs to be focused now in the continues shipping of supplies of medicine, fuel and food were for Libya’s urban centres. As the philosopher Ayn Rand mentioned in the quote with which I begun this post; it is necessary as well, that we keep a close attention to the outcome of this Libyan revolution in order to avoid that another variant of a slave society in the conquered country with national or international control.